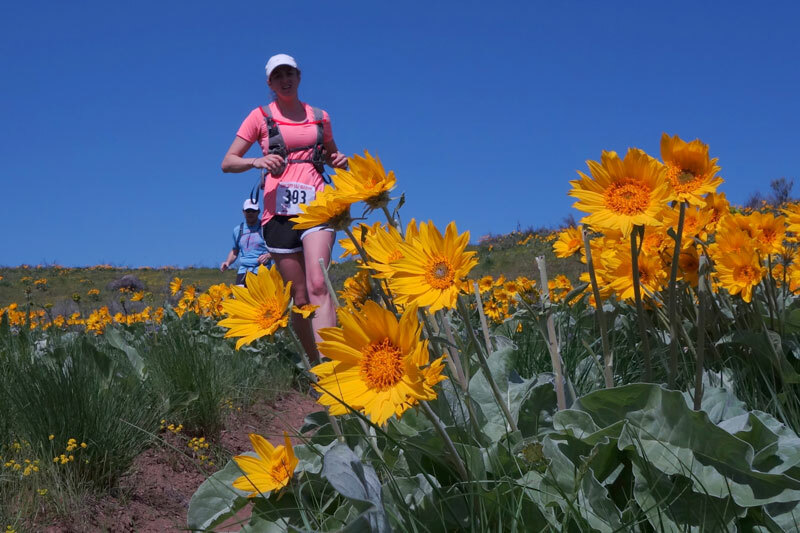 Come celebrate the 39th annual running of the Sunflower Relay, 1/2, and Full Trail Marathon! This is an incredible opportunity to run through some of the most spectacular fields of wildflowers in the Methow Valley. This race is limited in team relay and 1/2 marathon spots and they do fill quickly. Register early! ***The 2019 Sunflower Marathon, Half Marathon and Relay are all FULL. This event is now CLOSED. This unique course begins at 2180 feet elevation in Mazama and includes well marked deer trails, single track trails, and gravel roads. Stunning views of the Methow River, North Cascades and Chelan Sawtooths abound from flower carpeted meadows and fields. At two points, racers climb to 2600 feet. The finish is at about 1600 feet in Twisp. This course traverses private property that owners generously allow use for this one-day only. Please do not pre-run the course prior to or after the event. Because of the presence of livestock, no dogs at start or finish lines, or on the course please. The Marathon course is a marathon-plus length at 26.8 miles. Expect breathtaking scenery and some sustained climbs and descents. A Half Marathon option begins at Sun Mountain Chickadee Trailhead and ends at the same Twisp finish line as other event options. The course is moderate in difficulty with some sustained climbs and descents. Total length is just over 1/2 marathon length. A marathon participant runs the entire course. Marathon participants are expected to run the majority of the course, not walk or hike. Out of respect for our volunteers and private landowners, marathon runners and teams must be able to complete the entire course in 6 hours - by 2:00pm. Half Marathon participants are expected to be able to finish their ~13.1 mile course in 5 hours or less - by 2:00pm. A relay team must have 2-5 people, and finish by 2:00pm. Kids 17 and under race for fee, but MUST register (includes signing online waiver) on time to participate. *Don't wait to register! Relay team and 1/2 marathon slots do sell out each year! *Entry fee includes race bib, participant packet, custom Sunflower t-shirt (for registrations before April 1), post-race lunch, and awards. *** Methow Trails is a non-profit organization. Income from this event supports year-round trail operations in the Methow Valley. There are no entry refunds, exchanges, transfers or rollovers, and the event may be cancelled due to variables beyond our control: severe weather conditions, fire, unhealthy air quality, road closures, natural disasters, or other unforeseeable events. Friday, May 3rd, 5-7pm for all event participants. Packet pick-up area in the courtyard between Mazama Store and Goat's Beard Mountain Supplies in Mazama. Goat's Beard, our Title Sponsor, will provide a "Happy Hour" with beer on tap and light snacks available for purchase. A great chance to gather with your team to finalize your race-day logistics. Relay teams: In order to pick up your packet on race day, your team captain will need to ensure that ALL of your team members have signed the electronic waiver online. You can manage that through your Databar registration account until May 1st. ***We HIGHLY recommend picking up packets (for ALL events) the night before your race (at the Mazama Store) to make your event morning less hectic. Saturday, May 4th, 7:00 - 7:30am for Marathon Runners only (not recommended for teams) in Mazama. Saturday, May 4th, 8:00-8:45 for 1/2 Marathon runners only at Chickadee Trailhead. Map: We do not provide a detailed map to respect the privacy of the landowners who allow one-day access through their property and make this event possible. PLEASE DO NOT PRE-RUN THE COURSE, we only have landowner access on event day! No dogs are allowed on the course at anytime. There are two significant climbs just after aid stations 3 and 4, and a significant descent at the end of the course. Relay teams will be given specific driving directions to relay exhange points at race packet pick-up. Here is a course map with relay legs, exchange locations and elevation profile. There are aid stations with water, sports drinks, and gel at all 4 exchange points, as well as mile 24.5. There will be food (chips, bagels and cream cheese, oranges, bananas, oreos etc.) at Exchanges 2, 3 and 4. Runners should bring any additional fuel/replacement tablets they may need. Relay teams are responsible for arranging all transportation for exchange points. We recommend that you drop off Leg 2 runner at the first exchange prior to the race start. Please minimize the time you spend at each exchange, to help us manage impact to local residents. There will be a morning shuttle bus provided from the finish line in Twisp to the start lines. Shuttle to Mazama (Leg 1 Relay and Full Marathon runners) leaves Twisp at 6:30am. Shuttle to Chickadee (Half Marathon) leaves Twisp at 7:45am. Race registration includes an incredible, fresh food lunch, catered by Stewart Dietz Catering, at the race finish venue beginning at 11:00am and offered until 2:00pm. Beer available for purchase. Food will be available for racers only. Please bring a picnic lunch for family members and spectators. NO DOGS ALLOWED ON THE RACE COURSE OR FINISH LINE VENUE. The finish line is a horse pasture, so blankets and/or camp chairs are highly recommended. The awards ceremony will be at ~12:30 pm at the finish line venue. Awards, created by local potter Emily Post, will be presented to the top three overall male and female winners (Youth <18, Open 18-39, Masters 40-59, Seniors 60+) of the marathon and 1/2 marathon, as well as the top three teams. Race Start - From Twisp, head northwest on Hwy 20 through Winthrop approximately 21 miles. Turn right at the Mazama Junction and proceed straight to the stop sign. Go straight through the intersection and turn right into the Corral Trailhead Parking Lot. Race Finish- From Twisp head 1/8 mile northwest on Hwy 20, cross bridge over Twisp River, take a immediate left on Ainsworth and a right on Berger St. After .3 mile Berger St. veers left, becomes Peters St. and turns to dirt. Follow signs to the Sunflower parking area on the right. PLEASE DRIVE SLOWLY through the neighborhood! Results will be posted following the race.